The Ab's own garlic butter, brushed over a ciabbata style bread. Oven baked to a golden brown. Also available with our shredded 3 cheese blend melted over top. This pretzel comes out of the oven soft and warm, just like at the ballpark. Bring the ballpark to your plate. Jumbo dog with your choice of toppings. Add chili or cheese for an extra messy and delicious experience. 6 breaded strips of real mozzarella cheese oven baked and served with salsa. Over a quarter pound of angus beef, grilled to perfection. Comes with a side of chips and a pickle spear! Meat or spicy vegetable chili wrapped up with a shredded pub cheese blend in a soft tortilla and baked in our oven 'till melted. Topped with roasted green peppers, Spanish onions, red tomatoes and a three cheese blend. Served with salsa and sour cream. Chili nachos come covered in your choice of thick meat chili or spicy vegetarian chili and a melted three cheese blend. Served with sour cream. Your choice of hearty beef or spicy vegetable. Come by to see our full menu! available in 10 oz half pints, 20 oz pints, and 60 oz pitchers. Too many to list-- check out our variety of domestic, independant, and imports! here are a few of our favourite from our 30+ options! come try any of our 40+ shooters! With 12 beers on tap and a rotating line, the Absinthe's always got your favourite. And that's not even including our extensive list of bottles and cans! We serve our Absinthe in the traditional style enjoyed by Hemingway, Picasso, and van Gogh! the Absinthe is a second home to many! Tag us in your photos for a shout out! 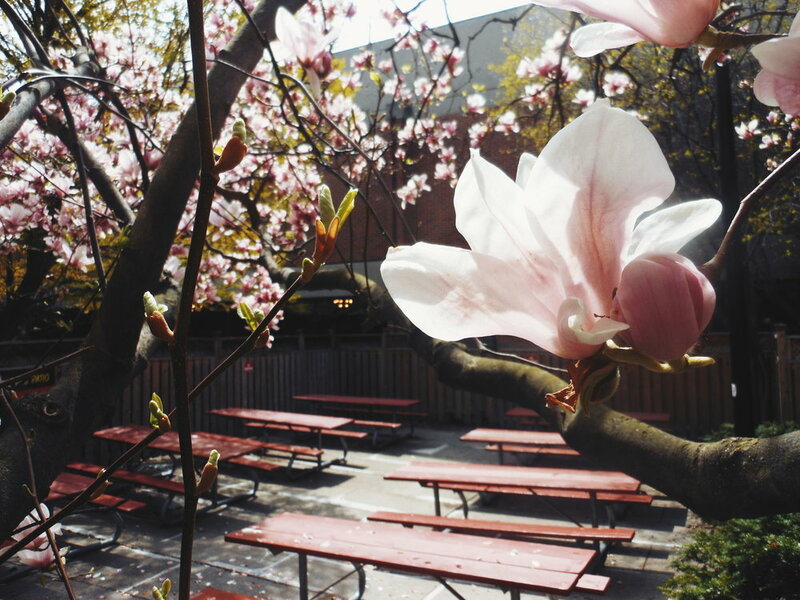 we love to sit and reminisce about warm weather and our beautiful patio. Though we are always accepting applications, our hiring period starts in August for the upcoming September to April school year. To be eligible for work during the school year, you should send in an application during the hiring period. Message us with any questions, concerns, or comments you have. Though it might take us a few days to get back to you, we value your input! Or call us at (416) 736-5441. Catch us on the flip side!